Our backyards are used for BBQ’s and family gatherings, playgrounds and football games. Don’t forget to use your yard for some good ‘ol wind down time! 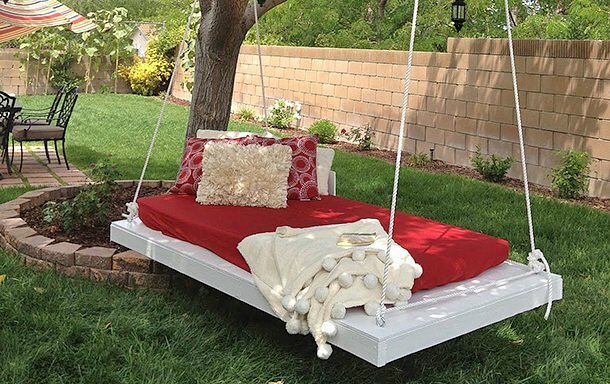 These 13 projects for backyard relaxation will help turn your garden space into a zen place. Catchy, right? 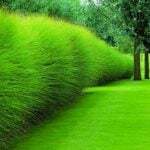 :) Remember, gardening isn’t all about garden chores and lawn mowing. Sometimes, it’s about learning how to enjoy your backyard, and just chillin‘. From ‘Pottery Barn‘, we love this backyard bed space too! Want to make one of your own? 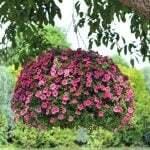 Then jump on over to our post on DIY garden hanging beds and find a bunch of great tutorials! If you love those hanging beds, then try something a little different with this deck makeover by Sarah Dorsey for ‘Home Depot‘. In this one post, there is a tutorial for her DIY hanging bench, cable railing, privacy curtains and deck makeover. What a cool space to have a glass of wine or tea in! Love these backyard projects! Need a more comfy spot, perhaps under a tree? For a whole afternoon? We feel ya. 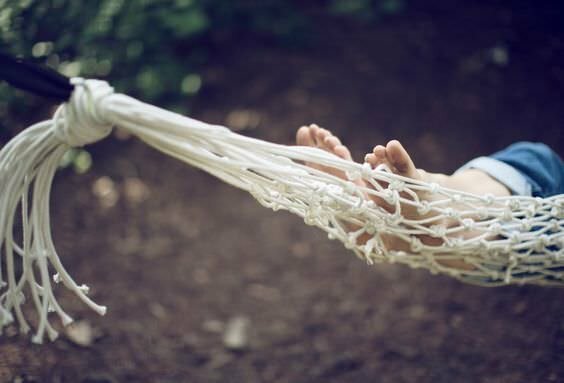 Try this DIY hammock from ‘Martha‘ made from a simple drop cloth. Or learn how to make a rope hammock from ‘Kinfolk‘. This is just inexpensive nylon rope and overhand knots! Or for more ideas, check out our post on DIY hammocks. Our next project is a DIY hanging bed from ‘The Devoted Wife‘. 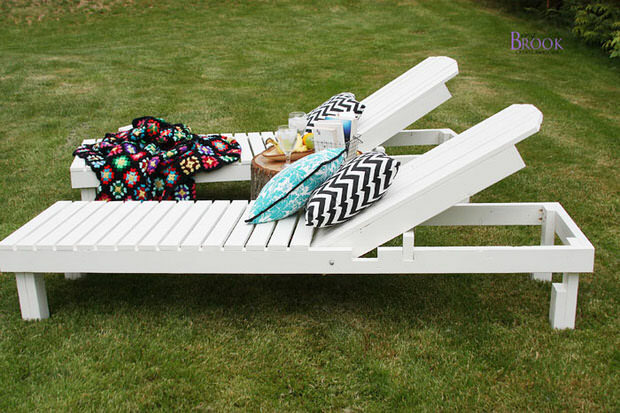 These DIY chaise lounges look perfect for a warm afternoon! Made by ‘Being Brooke’ at ‘Ana White‘, she did these for $35! Ok, now you have a place to relax your body, now it’s time to relax the soul! 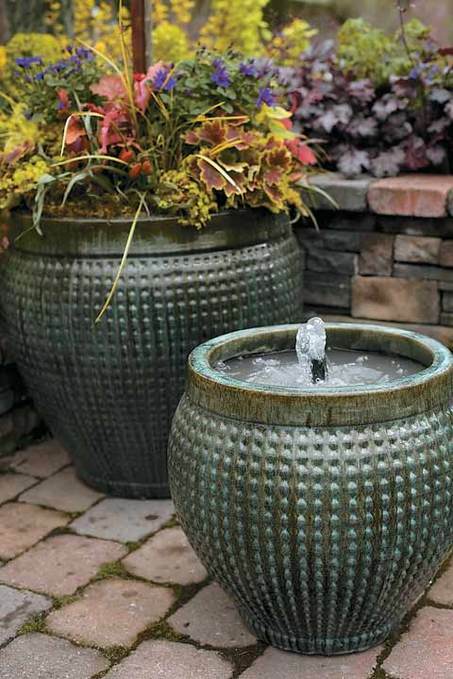 Start with water… this DIY fountain from ‘Oregon Live‘ ought to do it! 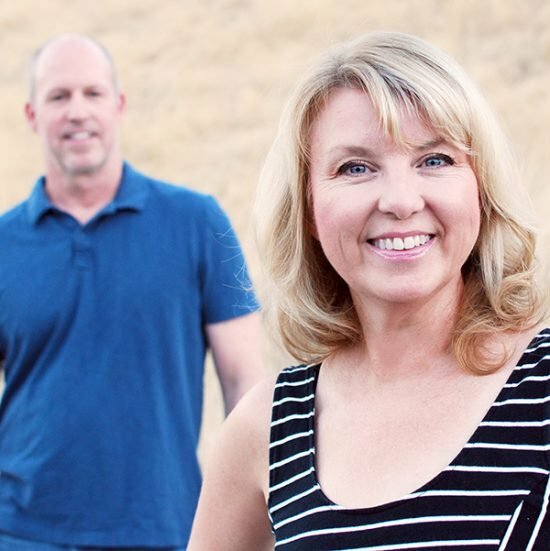 ‘Diane and Dean‘ have another take for you…. They did this garden fountain on the edge of an existing pool to add to the ambience, and it looks kinda “tropical wonderland” to us! If water hasn’t gotten you there, how about wind? Make your own wind chimes with this tutorial by ‘HGTV‘. This is a simple project for backyard fun using a craft round, pipe and twine. Or make these DIY wind chimes in an hour with things from the shop, including simple washers! 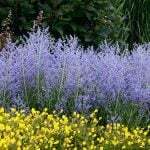 From ‘Bob Vila‘. Ok, so now you’ve had a relaxing afternoon, but the evening is creeping in… No need to start the stress parade again.! Just fire up your DIY propane fire pit! This one from ‘WC Welding‘ was done in just 5 steps from a garden patio table. 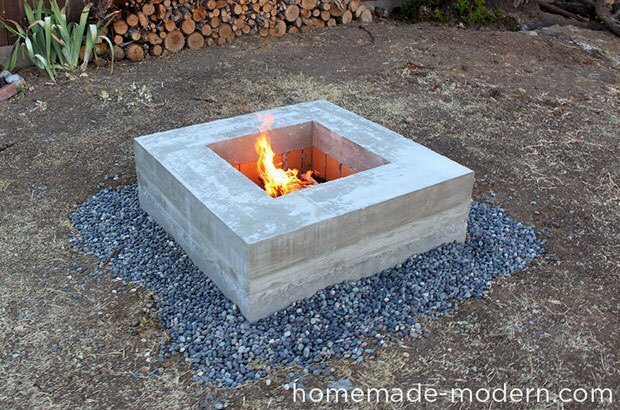 Finally, if you want to get a bit serious, jump on over to one of our fav sites, ‘Homemade Modern‘ and learn how to make their concrete fire pit. Ok, are we officially in kick back mode yet? Good, if you enjoyed these projects for backyard relaxation, then check out these posts on How to Build a Backyard Fire Pit and How to Build a Backyard Playhouse! 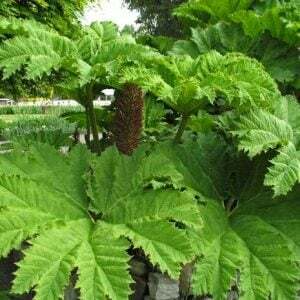 ← Hardy Tropical Plants You Can Grow! 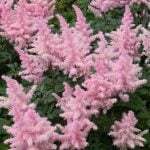 Hardy Tropical Plants You Can Grow! I love the hanging beds! The fire pit is an absolute must for patios anymore. How can you host a party without one? Thanks for the great post.